These Strawberry Sweet Rolls with Vanilla Cream Cheese Icing are the perfect make ahead breakfast or brunch recipe, especially for a crowd. You can make them way ahead to freeze, or just refrigerate overnight. 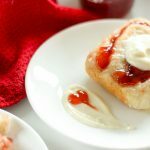 Light and fluffy dough, warm strawberry jam and creamy vanilla icing make them a delicious treat! In a large bowl combine flour, yeast and salt. Set aside. Put vinegar in a measuring cup. Add milk until it reaches the 1 cup mark. Set aside to let milk curdle. Melt butter in a bowl in the microwave. Add sugar and mix well. Then microwave milk mixture for 1 minute and stir well. Add it to butter. Add two eggs and whisk well to combine. Test to make sure it's not too hot or too cold (you're just looking for warm). Then dump into the dry mixture. Mix lightly, then fill your measuring cup with 1 cup of WARM water. Slowly add it to the dough, stirring lightly until the dough comes together into a sticky ball. This too almost 1 cup for me but it can vary. Don't overmix. Cover dough and set it in a warm place to rise for 45 minutes. I like to put the light on inside the oven and put it in there. After the rise time, sprinkle some flour on the counter and pull out the dough. Sprinkle with a bit more flour and pat out into a large rectangle. Then use a rolling pin to make the rectangle larger and the dough thinner. Spread dough with strawberry jam. More jam tastes better, but make sure you can roll the dough without it oozing too much. Roll dough up. Use a sharp serrated knife or unflavoured dental floss to slice it into rolls. Grease a baking dish or freezer pan. Put rolls into the dish. If you're baking right away, preheat oven to 350 degrees F and set dish in a warm place to rise for another 25 minutes. If you want to freeze, wrap it tightly, freeze and thaw on the counter for a few hours before baking. You can also wrap the rolls and refrigerate them overnight, then let warm up/rise on the counter before baking. Whenever you're ready, bake in a preheated oven for 25 minutes. While rolls are baking, use a mixer to combine the icing ingredients until smooth. Spoon onto warm rolls.